One of my rail industry colleagues sent me this photo of the floodwater out on the Nullabor Desert. You may recall the massive cyclone which struck Queensland and flooded some two storey houses to their roof line. Another major storm struck the North West of Australia and the floodwaters have been making their way south across the continent over the last several weeks. The Trans Australian Railway between Adelaide and Perth has been cut by the floodwaters and isn’t expected to reopen for four days. This is as far as the Hi-Rail vehicle was able to go. You can just see the faint outline of the submerged rail at the end of the vehicle bonnet and to the right of the right floodlight. 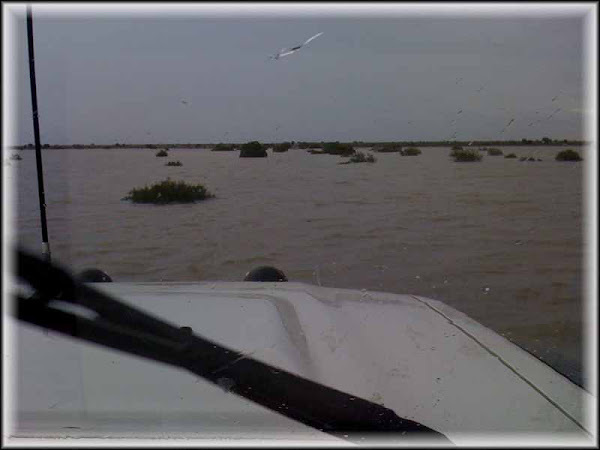 The waters extends to the horizon in all directions (except behind the vehicle). Chris Bell asked me check, and sure enough, Doo Lali Ali has been delivered to Ben's GH mooring for completion, so that Waiorou's shell can go into the shed at Hixon. This morning we received an email from Kelly Harp informing us the shell of Waiouru had been move to Ben's premises at Hixon. Do you know how close Doo Lali Ali is to completion? I presume Chris is DAA's owner; see his comments on my last post bar one. It looks done from the outside, but Chris says there's around 2 weeks work to do to finish. In my reply comment to Chris, there's a link to two OKish photos of her from the outside. I hadn't picked up on the comments from Chris Bell posted on your blog. I don't believe it...... The colour scheme of Doo Lali Ali is exactly the same as ours!!!! Interesting looking hatch arrangement at the stern. Grandparents Out There – You will understand! What Happened to the Sky? What a Difference a Couple of Weeks Can Make!